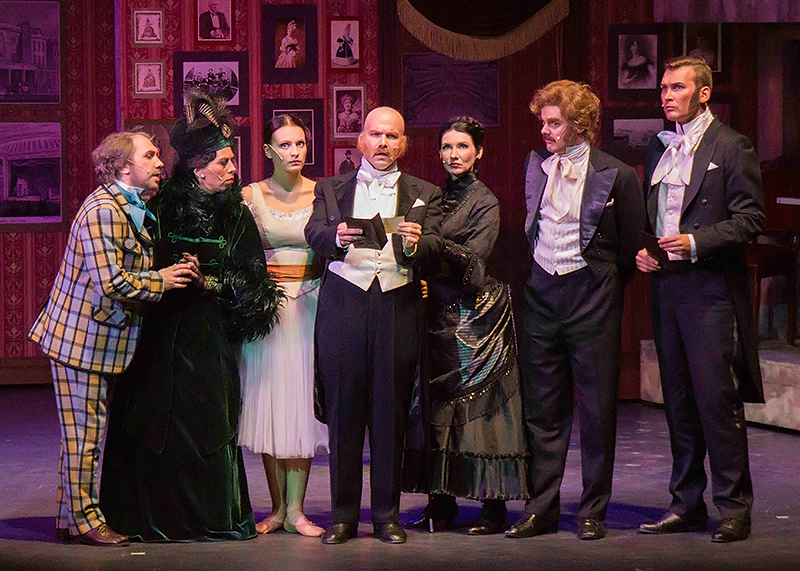 Teater Vanemuine's take on The Phantom of the Opera is something new. And when it comes to Phantom, new is a big deal – only a handful of directors have ever been allowed to stage their own vision of the most popular musical of all times. I'm so happy I got the chance to see this brand-new version of the classic. The Estonian production, directed by Georg Malvius, made me see the iconic story from a fresh point of view. This production focuses on Christine's story. The young soprano is truely the heroine of the tale, with the men as her supporting players. Christine's growth as an artist and as a person are at the center of the story. I really, really liked that. It was also refreshing to see the love triangle aspect of the story toned down. In the original version of The Phantom of the Opera, I see the two leading men representing two different kinds of love Christine has to choose in between. Will she pick the romantic, safe, naïve relationship, or the sensual, mysterious, exciting one? In the Estonian production, I felt none of that. It is clear that Christine's only true love, body and soul, is Raoul. She is drawn to the Phantom because he tricks her into believing he's a real angel of music, not because of any infatuation. When it turns out he is not an angel at all, her feelings are overpowered by fear. I liked this. It made the Phantom's love towards Christine even more tragic, and Christine's ultimate choice made a bigger impact on me here as well. Since Christine seemed to have no romantic or sexual feelings towards the Phantom, her sacrifice during the final scene felt greater than in the original. Her love for Raoul was her sole motivation for choosing to spend a lifetime with the Phantom – a man she has learned to fear. Of course, much of this is present in the original already. But the different nuances this production gives to the story made these points stand out to me. And you know what? I think I prefer the story the Estonian production tells to the original. I like how Malvius's direction doesn't pit romance and sexuality against each other on any symbolic level. And to be honest, this is the first time I've really felt the Phantom learning what love means when Christine kisses him. And that kiss! Instead of a big kiss on the lips like in the original, Christine seals her decision by kissing the Phantom on his deformed cheek. A lovely nod back to the original novel by Gaston Leroux – and, for me, a much more effective moment than the original. The first act of compassion the Phantom's ever experienced felt so genuine and so selfless here. I also liked how Christine and Raoul's relationship isn't perfect, though it is clear they love each other. After Raoul gives his little speech about every hope and prayer resting on Christine's shoulders (no pressure! ), he tries to kiss her – and she pushes him away, leaving the scene. I loved that little moment. Raoul is not a perfect dashing suitor. He makes mistakes too, and Christine isn't afraid to show him if he has made one. And yet, true love prevails in the end. To say Maria Listra is absolutely fantastic as Christine is a bit of an understatement. 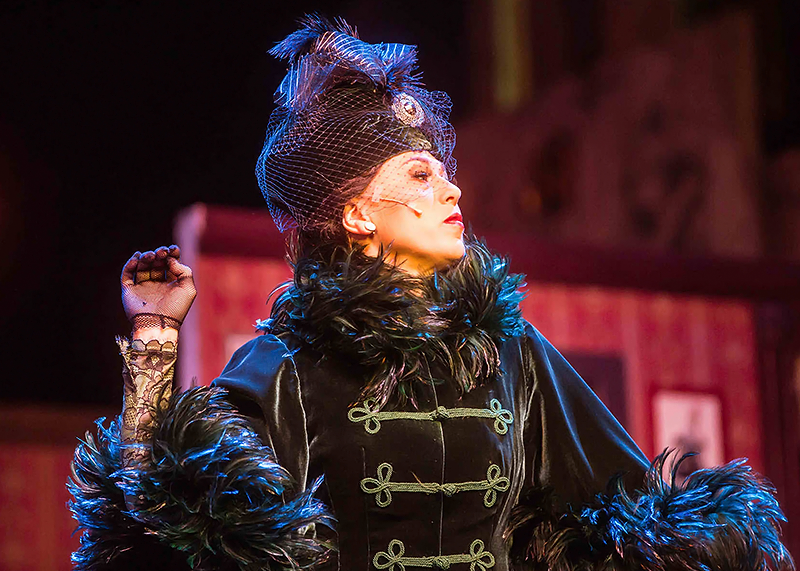 It's partially because of her stage presence that the focus is so strongly on Christine. I adored Listra in the role, both acting and especially singing-wise. She sang her part so beautifully. Chills ran down my spine during the whole Wishing You Were Somehow Here Again, and judging by the huge applause, I wasn't the only one. I don't have a single bad word to say about her. Stephen Hansen made an interesting Phantom. The character isn't easy to like, nor as suave as in the original. He tries to offer Christine the best he can, but he's clearly far too isolated from society to function in it properly anymore. Threatening yet awkward, a deranged genius meets a pitiable lost soul. The ending of Final Lair, with the Phantom coming to terms with what love means, touched me. Vocally, Hansen isn't as impressive as some of the Phantoms I've heard – but a fascinating portrayal nevertheless. 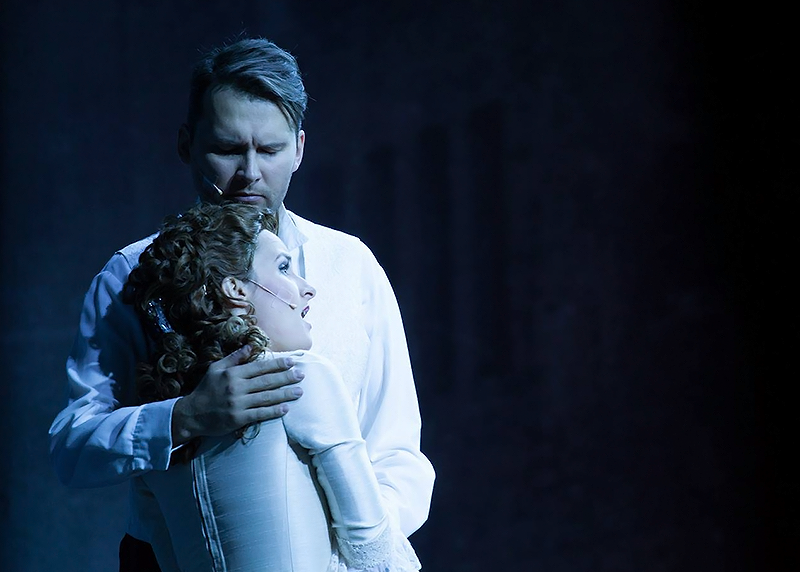 Koit Toome's Raoul is a nice balance for the creepy Phantom. Nice, handsome, normal, yet also brave and a bit hot-headed. A guy you'd like to know. Someone you would feel safe being with. I like how comic relief is added to the Phantom's story a bit more subtly than the usual musical way of slapping a huge funny song in the middle of suspense. I tend to enjoy the scenes with La Carlotta and the managers of the opera house, and I liked them here, too. Lauri Liiv (familiar to us Finnish musical fans for his amazing portrayals of Enjolras and Bamatabois in Tampereen Teatteri's Les Mis, and therefore someone I paid special attention to) and Priit Strandberg as Messieurs Firmin and André do a good job lightening up the mood. I also really enjoyed Kristina Vähi's Carlotta. A true prima donna in every way, from her gorgeous singing to her perfect diva attitude. A force to be reckoned with! 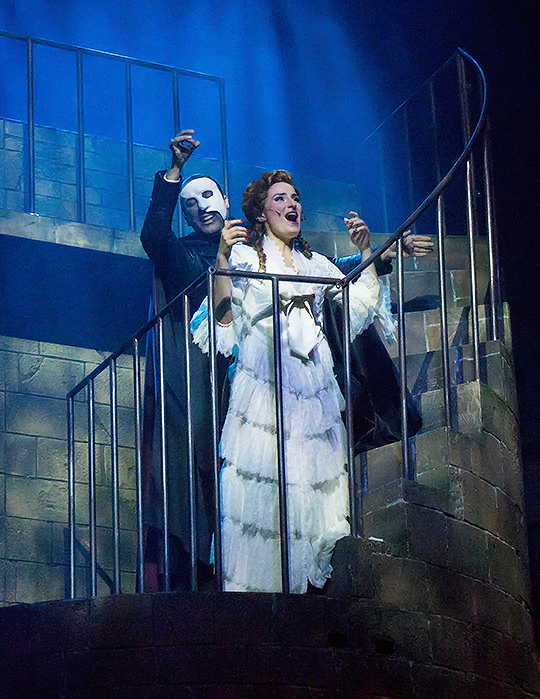 Visually, the original Phantom is the most gorgeous show out there. Compared to the glitter and glamour of West End and Broadway, everything else is underwhelming. But, trying to forget that for a moment, I think this production looked nice. Not amazing, but not too bad either. I quite liked the costumes by Ellen Cairns. I think they suit the characters well enough and actually look a bit better onstage than in pictures. My favourites include Carlotta and Piangi's couple costumes in Masquerade, with them attending the ball as the Queen of the Hearts and the White Rabbit. And say what you might, I think the Phantom looks good in a leather jacket! The sets by Iir Hermeliin have their moments, but some of the key scenes were disappointments. The small and very slow-falling chandelier, the Phantom's odd space-age lair, the burrito-like pocket in front of the rooftop angel statue. Not really to my tastes. Putting the lake Phantom and Christine cross during the title scene on a bridge high above the stage is a nice touch, though. And the very end of the show looks very effective, I'd say more so than in the original. The music, then, sounds absolutely gorgeous. A big orchestra combined with the fantastic voices in the cast... This is what a musical should sound like. I've talked about how I love seeing the original Phantom for the smoke and the mirrors, but don't really get that much out of the story or the performances there. Watching this production, I felt the other way around. The visuals were not all that stunning, but I suddenly felt more for the characters. I'm not saying Malvius's direction was perfect. Some scenes lacked suspense, some felt a bit confusing or awkward. But forgetting about minor faults and considering the story as a whole, I got more out of this vision than the original. Wonder, then, what the Finnish non-replica version will have in store for us next fall? Photos by Iir Hermelin and Tõnis Järs, from Vanemuine's website and Facebook. Hover over the photos for specific info. Thank you, this review actually made me think about a little trip to Tallinn. The Hungarian production has a similar-sounding updated focus on Christine and it made me interested in the musical again. I'm all for non-replicas that add something to the story and bring new valid points of view to it, and at least occasionally Malvius does a fairly good job with these. If you can still get tickets, go go go! :D It'd be interesting to hear what you think about this. Yeah, I'm very lucky that Finland is so close to Estonia and I actually got to see this version! Koit ja Lauri ovat Malviuksen luottonäyttelijöitä ja tekevät uskollista työtä. Koit on luonnossakin juuri kuvaillun kaltainen, täydellinen naapurinpoika. Hän olisi voinut olla Helsinginkin versioon nappivalinta. Ohjausidea kuulosti kiinnostavalta, täytyypä lähteä katsomaan! Thank you for this information and your impressions. I'm faszinated by this story for a long time, read the books (did you read Susan Kays book about the whole story of the phantom itself), saw films and musicals, but this 'interpretation' i never heard about. Glad to hear this post is useful to you! :) The Estonian production is definitely a unique take of the story! But I've never read Kay's book... Maybe I should check that out next.